Elifar has funded a new £3,050 lightweight wheelchair from GBL for 11 year old Vivi from Windsor who has spastic quadriplegic cerebral palsy. 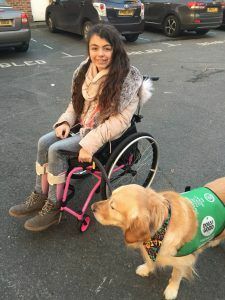 Vivi’s current NHS chair has been extended several times to meet her growing needs and had become so heavy that her mother struggled to lift it into the car. The new chair can be self-propelled and gives Vivi increased confidence and opportunities to make more friends and develop social skills. As she starts senior school, her family wanted her to be independent. “I’m a real I can girl but with this old wheelchair I just can’t and I have tried. I am nearly a teenager and I want to hang out with my friends without my mum behind me pushing,” says Vivi.